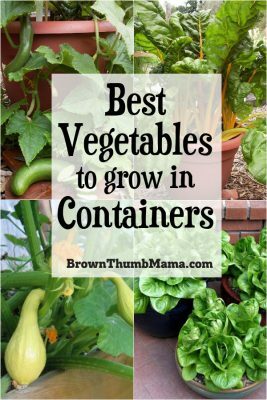 Here are the 5 best container vegetables for beginning gardeners. They’re all easy to start from seed and will grow happily in pots on your patio, driveway, next to your pool…wherever they fit. Are you a beginning gardener? New to ideas like crop rotation and plant thinning? Don’t worry–vegetable gardening doesn’t have to be a chore. 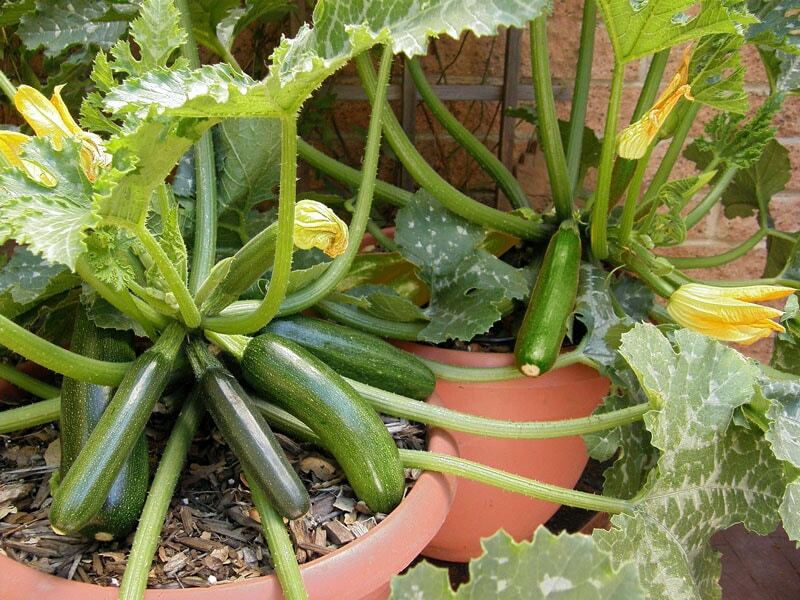 Even if you only have an apartment patio, you can grow your own vegetables in pots or containers. There’s no comparison in flavor, and a $3 packet of seeds will give you plants for several years. Growing vegetables in containers is an easy way to enjoy fresh food without the hassles of pulling weeds or tilling the soil. All you need is a pot, good soil, and sun! Tadalafil (Cialis) and its active substances are the ideal one-time remedy for erection. But you shouldn’t forget about the need for an independent solution of psychological barriers. Important! Container plants need excellent potting soil and natural fertilizers. See the exact fertilizer I use and recommend. 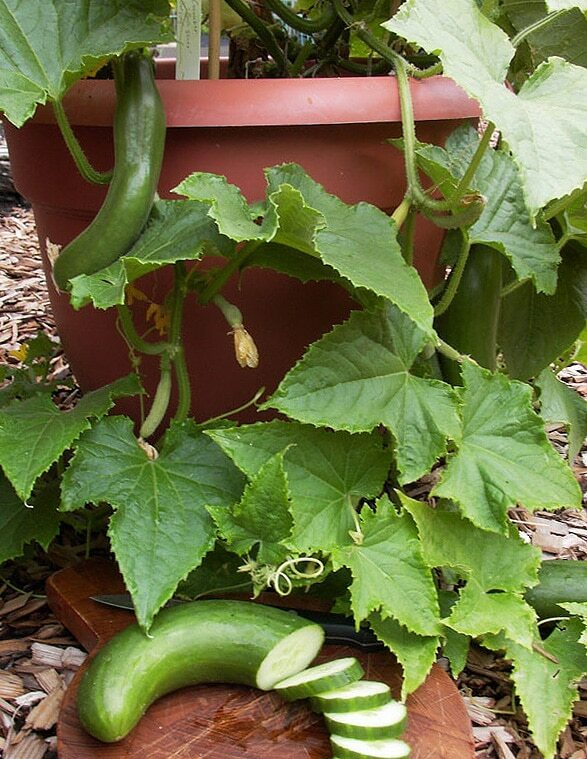 These juicy slicing cucumbers grow quickly on disease resistant, dwarf bushes–perfect for a small space or container. The 6 to 8 inch long fruits have smooth, tender skin and sweet, crisp flesh. Astia is a French bush variety, developed especially for containers and small space gardens. Its compact vines are ornamental, early bearing and productive, with easy to harvest, glossy green fruits. They’re delicious in Zucchini Fritters or added to fried rice. Delicious, reliable and highly ornamental, these vigorous plants have crunchy golden stems contrasting with deep green leaves. They’re perfect for containers or striking mixed borders. 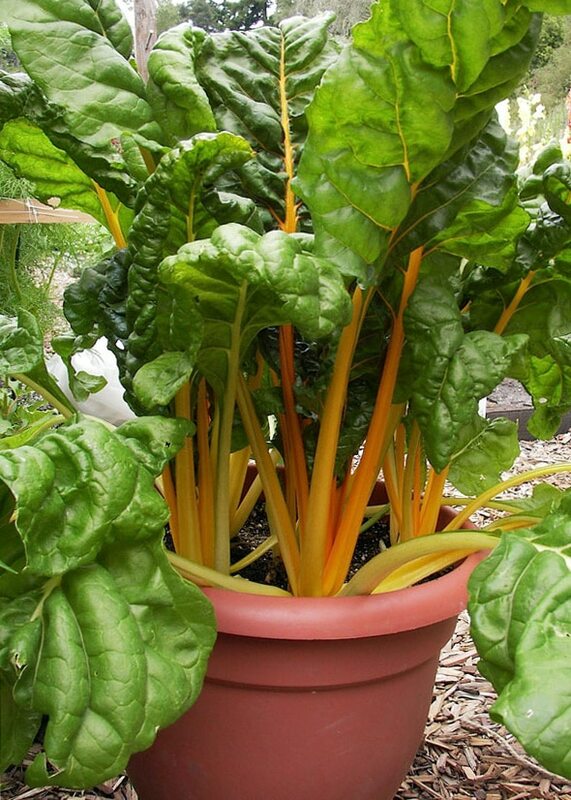 Don’t think your kids will eat chard? Here are some ways to get them to try it. An heirloom gardener’s favorite, Jade Gem has fat little rosettes of juicy-sweet, wavy leaves that look like a plump mini romaine. 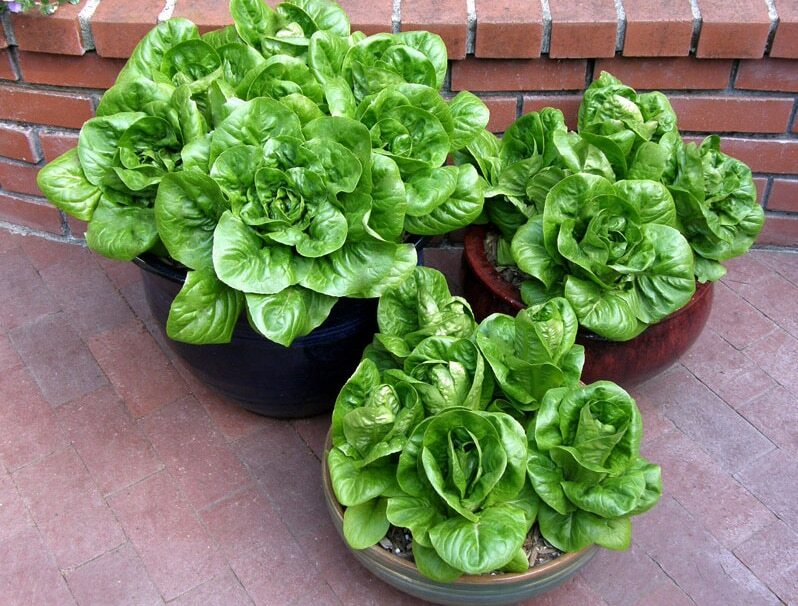 Grows quickly for long harvests of ready-to-eat salads with homemade croutons and Orange-Balsamic Vinaigrette. Rolande are extra-slim, long deep green filet or “haricot vert” snap beans. These delicate beans have superb taste and an extra-crispy texture. They’re delicious when added to a stir-fry or Honey-Garlic Chicken. Be sure you’re planting at the right time with a customized vegetable planting schedule. If outdoor cats are getting into your garden containers, here are some ways to keep them out. Use a large container so the roots have space to grow. It doesn’t need to be a fancy pot–an empty 5-gallon bucket with drainage holes is perfect. Don’t use regular garden soil in your containers. A good commercial potting mix will give consistent drainage, is free of weeds and pests, and has lots of nutrients. I like this variety but for heaven’s sake, buy it locally. In the heat of summer, check the soil dryness at least every other day. Stick your finger in the soil and if it’s dry below the surface, water. Once a month, apply diluted fertilizer to the containers. I use this, although it’s a little stinky. Great suggestions! A pot of cherry tomatoes would be another great addition to the list. I grow all my herbs: rosemary, thyme, oregano, parsley and basil in containers on my S-SW exposure terrace and they thrive! Ooh that chard is gorgeous. Hello from Tuned-In Tuesday. I tried container gardening last year for the first time and did not find much success, but I have faith that this year will be better. Thanks for your post! I live in the city. My garden grows all but corn, and ALL in pots. You need at least 18in circumference for smaller single plants like pepper & egg plant. I grow any variety of tomatoes, but they need 24 inch across pots. Small pots don’t hold enough moisture or nutrients. Water deeply once a week. Place tray under pots in very dry weeks of summer to hold water. Fertilize one scoop of vegie fertilzer tossed onto the soil then ‘water it in’, on the days you deep water. Once or twice a month. To keep the weight down, put large chunks of broke pottery and or thick rigid packing foam in bottom 1/3 of large pots. It also helps with drainage. Good luck this year! We are trying container gardening for the first time. With our age and health problems we just can’t do the garden we used to. Thanks for the tips. Any advice on growing potatoes in bags? My friend had great results using a large (open bottom) tub. All the potato ‘seeds’ went in the bottom with good loose planting mix. When the plants came growing towards the top, she added more loose planting mix part way, & let plants grow again… until she got to the top. She pulled up the tub to take potatoes off the bottom. Buried in layers gave her higher yield. Open bottom tub made it easy to harvest. I was thinking I’d try her method. You have to use straight sided tub or use the wider side down, if you plan lifting tub to remove the potatoes. This year I am doing ONLY container gardening. Our area is in severe drought and are VERY restricted in watering. But I have tanks that gather the little rain we do get. This year I am going to change my watering system. In the past I would water my containers daily (with a watering can) only to watch half (or more) drain right out:( I looked into buying cones and glass bulbs that water slowly but found a better way and cheaper!!!! I have found that using”smart water” brand disposable water bottles with the blue flip caps do a GREAT job. I fill the bottle, tip it into the container,and it takes about 20 minutes to drip into the container with NOTHING leaking out from the pot. Let me know what you do! Another great use to water are large plastic bottles that pop comes in. Punch holes in the cap with a nail or drill, and put in soil, or hang above plants. This is a great repurpose of a litter product, and also release water slowly. Your kids can paint them great colors to add a great feature and make it a family project. Your idea is great. We take the bottles hung upside down on shepard’s hooks above our container pots. We paint each bottle with either a pretty design or we paint them with the same plant(flower or veggie) in the container and then put the containers around in the yard. Fancy and we have had many compliments. Thanks this is great! I’m VERY new to gardening (I’ve only tried basil before and I almost always end up killing it). When should I start planting these? Like now? I live in Utah. I don’t have good luck with gardening every year, but keep at it and you’ll be overflowing in zucchini in no time. You should be able to plant in the middle of May, but I’d check with the County Extension office or a friendly neighbor to make sure. Good luck! Awesome!! Am 8 months pregnant now. I have started to have a carving for lettuce and zucchini since the moment I saw your photos!! And whether it is possible to find cheap Cialis if everything is good with the potency? Sometimes I want to experiment but I know that there may be side effects after taking of Cialis. Besides cheap generic Cialis is safer than the same dosage of Viagra. Great post! I am a fan of container gardening. I also live in Central Valley, CA. This is so helpful, I have to try ! Thanks! I have found that plastic totes and rubber totes from the good will make great containers even if they a hole or a crack. Is there anything that can be planted now? Are there fall and winter veggies that can be done this way as well? Thanks so much for the advice! Can you use 5 gal paint containers, big heavy plastic ones that the pros use if they are cleaned out? You could…but I would rather use food grade….some restaurants get their pickles and condiments in 5 gallon buckets and will save some for you. I also got some nice semi-clear ones after running a want ad on Craigslist. I have used some that used to hold natural laundry soap, sold to me by a man who ran a coin-operated laundry. Only drawback, heavy and can hurt your back! how about some fall/autumn gardening inside or outside anyone? I tried container gardening this past spring, but had no luck! I tried zucchini and edamame. I live in Northwest Florida and I am wondering if the plants get too hot in the pots? I didn’t think about it until someone mentioned it to me. Also, the pots were black plastic. Does anyone have any ideas if this could have been the problem? Thanks! Container plants can overheat. Some afternoon shade can help. But watering morning and afternoon could help also. My one tomato, planted with basil, and one pepper did real well in upper 90 degrees. You could paint your pots white. 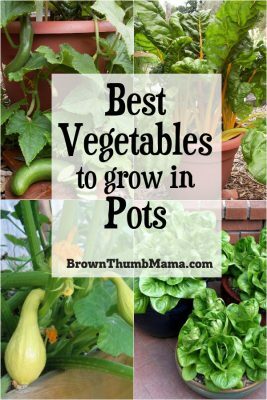 AND….veggies in pots are big feeders! I added a tbsp. of bone meal plus time release fertilizer to the top 4″ of my potting soil before planting, plus more time release fert. after about 2 mos. due to almost daily watering. (A grown tomato or pepper requires 1 gal. water daily!) if plants get puny, feed with MiracleGro. Better luck next year! Hello, new to this post. I tried growing tomatoes and peppers in a planter (rectangle) my MIL gave to me and I had no luck! I live in SE Texas, started the seedlings in April in our window and they did well, planted them in the planter and they grew tall and were ‘leafing’ like crazy, a few flowers, but they fell off and no tomatoes. Then they died. I was watering when the plants looked dry. At first I was using a miracle but then I quit, because someone at the farmers market told me there was enough nitrogen in the soil. Ugh! I really want fresh tomatoes… I am going to try again this spring. Those rectangle pots are a joke! Tomatoes, especially, have a deep root system, so they need a big, deep pot. We are all organic…except for our potted plants. Miracle Gro potting “soil” is the easiest to find. Do not use the newer one for water retention. We had no luck with it. Get your big pot…5 gal. or larger and PLASTIC…and lay some cheesecloth or old pantyhose over the hole. Maybe a handful of gravel for drainage. Fill will potting soil, tamping it down well as you go. I add a small handful of bonemeal and sprinkle time release fertilizer and work it into the top 4-5 inches. Plant ONE tomato or pepper plant per pot. Add stakes at this time also. I also plant 2-3 basil plants around the veggies. Basil is shallow rooted and won’t compete. (Clip off any basil flowers as they form, so the plants won’t die.) Place pot where you want it! You won’t be moving it! Half a day of sun is a must…preferably morning. Our pots just get dappled afternoon sun. Water pot til top of soil is covered. Wait at least five minutes and then water at least twice more the same way. Heavy watering can just run out the sides. During hot weather, if soil has pulled away from the sides of the pots, use an old fork to loosen and stir the soil around the sides. An old timer told me to always water in the late afternoon, since plants grow at night. (??) but keep water off the leaves(fungal infections). A tomato plant can use one gallon of water a day, so water regularly. During drought, you can even collect used bath water! I add more time release fertilizer, maybe early July, and sometimes water with MiracleGro. We had lovely tomatoes, one or more a day, until August. Heat? Exhaustion? This year, I may plant one or two more in July. We had plenty of peppers too. I wish you better luck this year! AND I have read that a little Epsom Salts when you get blossoms will prevent blossoms from dropping. We have an absolutely horrible time with cucumber beetles each year. The decimate our plants. Any suggestions for keeping them off if we plant in a patio container? Google cucumber beetle traps. If the work like japanese beetle traps, though… you’ll want to buy some & give them to your neighbor… because they invite more beetles to visit! My backyard is huge, over 260 feet deep. But I’m getting older and an inground garden was getting too hard for me to weed and keep cleaned up. So I threw grass seed in the garden area, and I have a huge round tractor tire full of good Iowa black dirt, two half wine kegs, about 10 large planters, and a 8×4′ above ground plastic garden spot. I get enough tomatoes, peppers, green beans and squash to keep me happy. And I can take a chair out, and sit and weed and clean around the plants. Then in the fall, I buy two bushels of tomatoes to freeze. And I’m done! We live in the Central Valley and our yard only has partial sun. Lots of morning and noon sun, but trees shade the later afternoon sun. Are there vegetables I can grow in containers that don’t need full sun? Thanks! Eggplant, cucumber, peppers, and lettuce all sometimes get sun-scalded if they’re in hot afternoon heated sun. Most of my garden gets sun from 10-4 if lucky. So I place those mentioned on the side of the garden that goes into shade earlier. Tomatoes on the other side which gets afternoon sun. That’s one benefit in container gardening– you can move the pots by handtruck, or dragging to change placements of the pot. Crop rotation is easy because I change and remix the top 1/4 or more of the soil. I add any composted manure and fertilizer at the same time each spring. Burpee is selling a ‘cloudy day’ tomato this year, that I’m going to try. Remember best to use large pots or containers like tubs that are 18 inches fr smaller veggies & herbs. 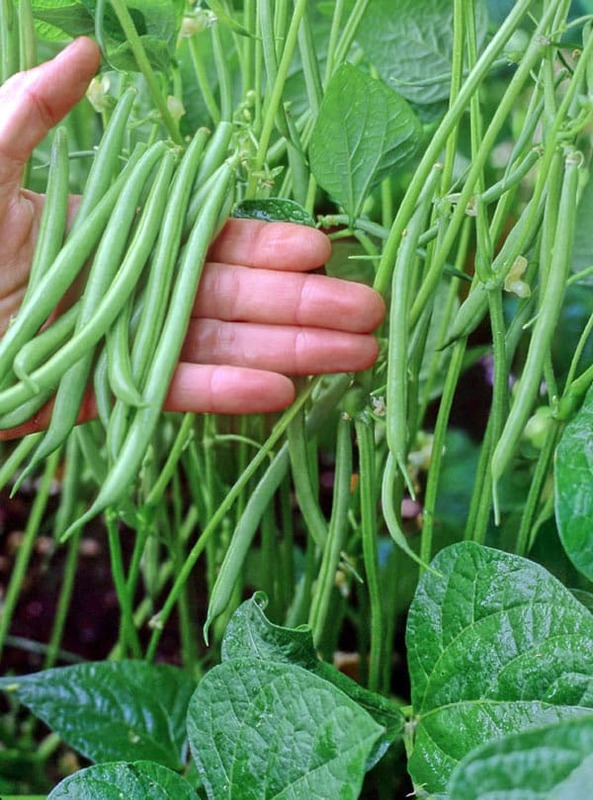 Larger veggie plants need 24 inches or more. About same depth. You can use some drainage material in the bottom to lighten the pot. I bought pot saucers to keep water access during hot dry weather. I ordered and paid for a customized vegetable planting schedule. It’s been a while and I haven’t received anything. Could you send that? Absolutely! I can look it up in the purchasing software. What email address did you use to buy it, and what zone? I love container gardening. Thanks for the article.